Decorating Easter eggs has been a tradition in my family for as long as I can remember. 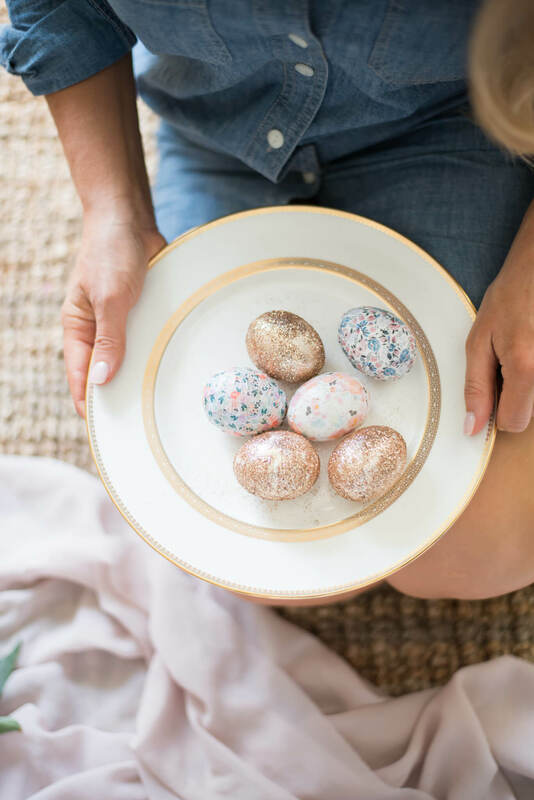 On Easter Sunday we’d use the bright color dye sets my mom bought from the grocery store and stain our hands and the table cloth while making tie dye eggs. One of the best things about having a kid of my own is the opportunity to experience these traditions with him now. 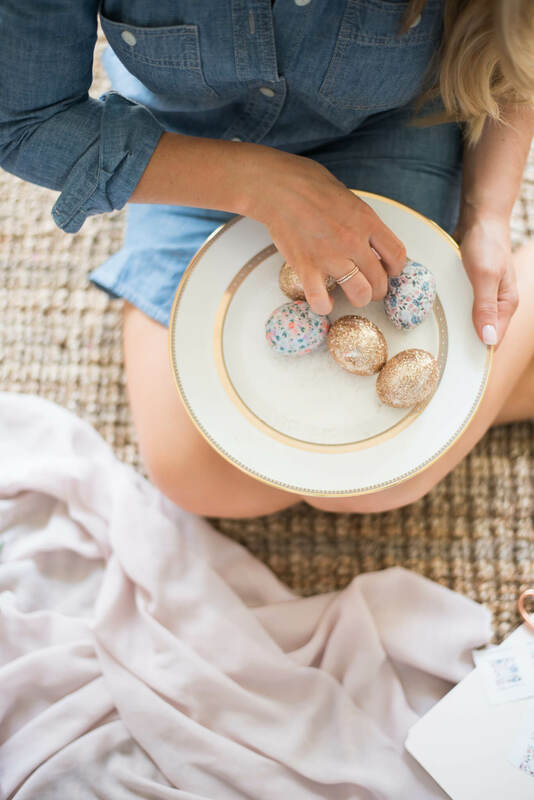 Although Tripp didn’t help toooo much in the creation of these eggs (he mostly just tried to eat them), just having him around makes me want to step up my game and make holidays festive like they were when I was growing up. Luckily for my bank account, these eggs cost less to make than the grocery store dye sets. If you have a color printer, some eggs, and some glue, you got this. All you need is your favorite pattern. If you’ve spent anytime on my Instagram feed, it’s pretty obvious that I’m obsessed with Caitlin Wilson. 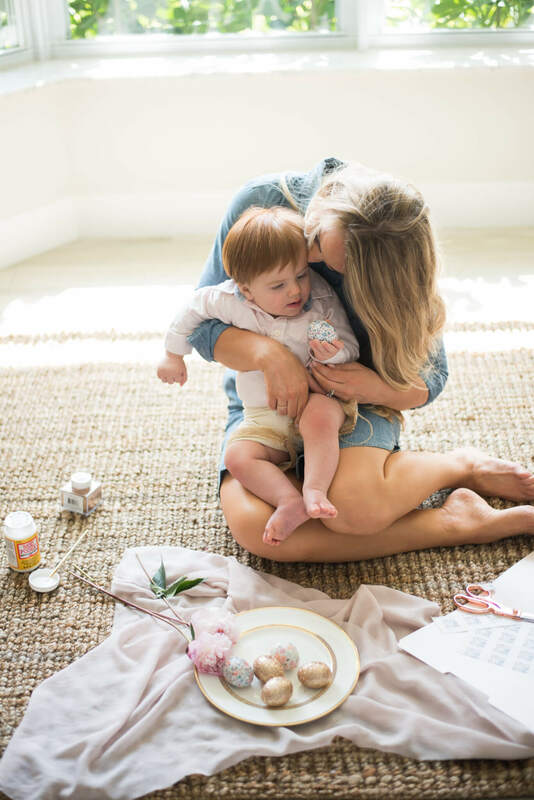 I love her feminine, floral patterns, and I’m saving up the big bucks until I can buy one of her rugs one day. So when it came to decorating Easter eggs, I knew just where to go. Decoupage sounds fancy, but if I can handle it, so can you. It’s super easy – it’s basically just gluing paper to hardboiled eggs. Pick out your favorite pattern on the internet, and print it in about 1 inch squares of it (there’s usually a setting you can choose when you print the pattern). Cut each individual square of paper. 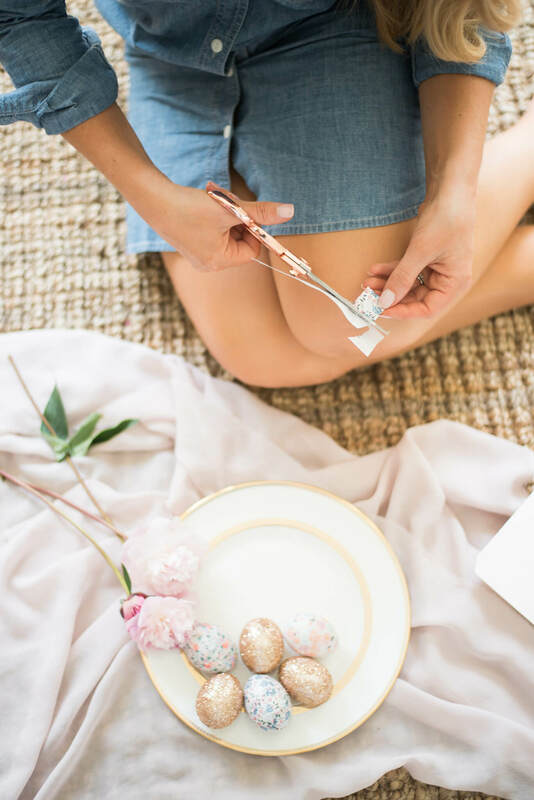 Using a paint brush (or an old eye shadow brush) spread a thin layer of Mod Podge over the section of the egg you’re working on. Flatten the paper on the egg, spreading mod podge over it as you go. Slightly overlap each square of paper with other squares so you don’t see any egg. Do about half the egg, and then put it down to dry before doing the other half so that the paper doesn’t stick to your hands. I laid my half done eggs on a cake drying rack. 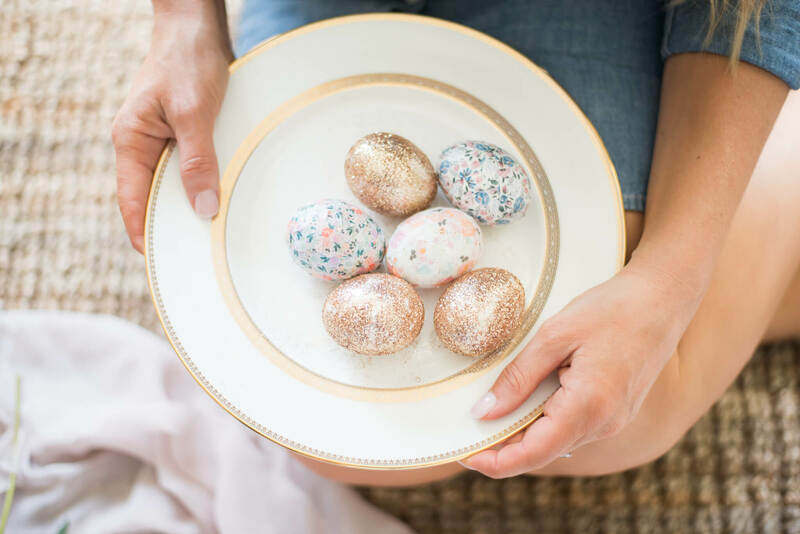 The glitter eggs are even easier – I just spread mod podge over half of the egg and sprinkled rose gold glitter over it (over my sink). Do half of the egg and let it dry before completing it. 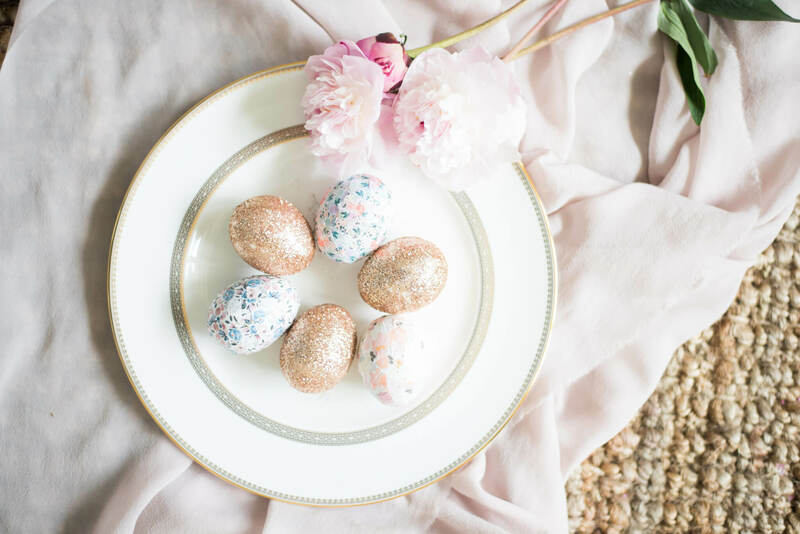 Have fun decorating those Easter eggs! I hope you used certified humane eggs. It saddens me to see how many eggs are bought for Easter, and then are left uneaten. Caged chickens endure so much hardship. My husband and I decided to adopt two hens (we named them Albertina and Georgette) and they have been laying us fresh eggs almost everyday! Never buying a grocery store egg again.